Built on a slope, it looks like a rather unassuming single-storey bungalow from the front, but at the rear it drops down with another level below. Whoever had built the house hadn’t taken the layout into account, however, as the design was very enclosed with a series of rooms leading off each other. ‘Paul and I could see that by remodelling the layout and installing floor-to-ceiling windows, the house would be transformed,’ says Sarah. Moving out of London to leafy Buckinghamshire, the couple wanted a more laid-back way of life. As well as having a good-sized garden, the house was close to shops and restaurants and, as the sale was chain-free, they moved in six weeks after putting in an offer. The re-planning of this level meant the bedroom was being taken out, so there was nothing to stop a new kitchen extension replacing the conservatory in such a prime position leading on to a garden terrace. 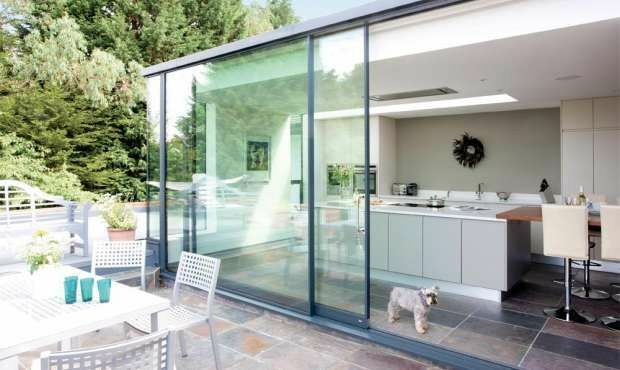 The architect designed a modern glass and rendered box extension featuring a continuous rooflight along the length of the side wall, which floods light into the working area of the new kitchen. ‘The design is intended to make the roof appear impossibly thin, while the height of the glass doors is maximised,’ says Sarah. One of the biggest outlays was the glass, which the couple sourced themselves to keep down the cost. ‘It was supplied by a specialist glazing contractor. Dealing directly with them saved us money, but the glass for the kitchen and living room still came to more than £50,000,’ says Sarah. Although the couple had a separate dining room, they wanted an informal dining space, too. The long shape of the kitchen meant there was space at the end of the island for a bar-height table. Sarah and Paul liked the idea that it would continue as part of the island, but kitchen designer Michael Manners suggested having it in wood to define the eating space from the food preparation area and add warmth to the neutral scheme. ‘We also felt it would be more comfortable sitting next to a wooden surface rather than a cold quartz one,’ says Sarah.